At Brides Love Yoga, we give each bride the opportunity to become more present, allowing her to soak up every moment of her big day. Heart-opening poses, detoxing twists & mind cleansing inversions are all an essential part to being a happy healthy bride. We also offer yoga packages for bachelorette parties, weddings, and private sessions with the bride. Yoga can be a great way to start off your wedding celebration or wind down from the big day. Relax, detox & spend quality time with friends & family. Pamper yourself & your loved ones, while creating memories that will last a lifetime. Schedule a yoga class at your home, hotel, favorite beach or park. Our teaching style offers a blend of teachings from the Vinyasa and Iyengar traditions. Vinyasa, which means “breath-synchronized movement”, tends to be a more vigorous style based on the performance of a series of poses called Sun Salutations, in which movement is matched to the breath. You move from one pose to the next on an inhale or an exhale. This technique is also called Vinyasa Flow because of the smooth way that the poses run together and become like a dance. Iyengar's method, a form of hatha yoga, is based on giving primacy to the physical alignment of the body in the poses. Rachael approaches yoga from an artistic mind. As a graphic design artist and photographer, she has a unique ability for understanding the lines created during movement. 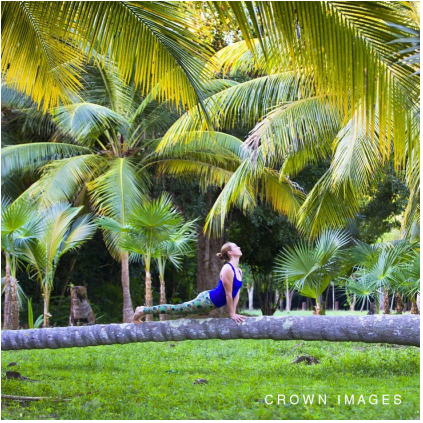 Rachael’s intrigue for yoga has intertwined with her love for art, particularly inspiring her photography. As an outdoor enthusiast, Rachael enjoys rock climbing, surfing, paddle boarding, wake boarding and wake surfing. These passions have encouraged Rachael to pursue Stand Up Paddleboard Yoga (SUP Yoga). This practice has enhanced her appreciation for the divinity of nature, while challenging her body to perform with balance, agility and strength. Drawn to water and warm climates, Rachael has pursued teaching opportunities beachside in St. Thomas, Miami, Cape Cod, LA and New York. Rachael is a fully insured 500-hour RYT yoga instructor certified through Yoga Alliance. Her yoga training has been based in New York City through YogaWorks. In 2009 Rachael received her 200-hour Teacher Training under the guidance of Sarah Bell and Jodie Rufty. Her 300-hour Professional Program was also fulfilled with the YogaWorks. Rachael completed a six-month apprenticeship with senior teacher Chrissy Carter and a second apprenticeship with Jodie Rufty. In addition, she is certified in Restorative Yoga through Jillian Pransky.In 2012 Rachael began teaching SUP Yoga. She is WPA(World Paddle Association) Paddleboard & SUP Yoga certified; including CPR, AED & First Aid certified. From April to October Rachael offers SUPyoga classes on Lake Oscawana, just an hour north of NYC. She also hosts several SUP Yoga Excursions throughout the summer months. ...more about our team coming soon! PRESS INFORMATION: For Press related inquiries please email: info@bridesloveyoga.com Please include the text "Press Inquiry" in the subject line for more direct assistance.
" I was the one to book our party and Rachael was a pleasure to deal with before we even got to the lake. She was responsive, answered all my questions, and worked with me to customize our group's package. The SUP yoga experience itself was absolutely incredible, and we felt completely welcome to make ourselves at home at the lake. Rachael paid attention to all the details - the food was delicious, the decor and set up were gorgeous, and most importantly the yoga was so much fun. She totally went with the style and interests of our group and we all had an amazing time. Thanks again for everything! " ​tree pose with our arms supporting one another. 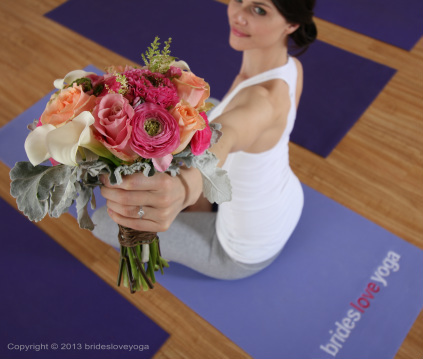 I've been to plenty of bachelorette parties and this was a unique experience - I definitely recommend Brides Love Yoga to anyone who is considering it. " - Lilianna C.
" I am a repeat customer of Brides Love Yoga and couldn't be happier with both of my experiences. 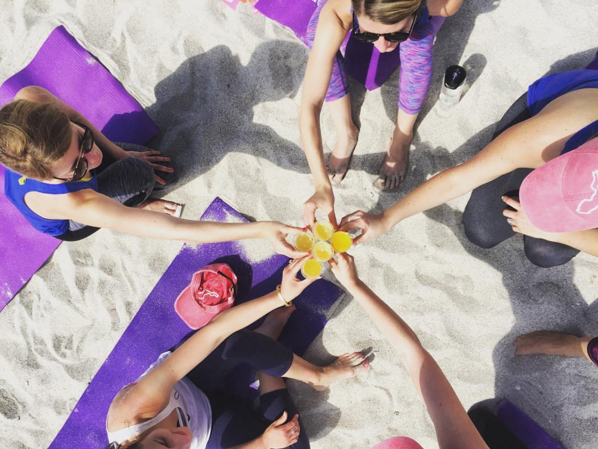 Brides Love Yoga set up a beautiful yoga class at sunset for my friend's bachelorette party in the Hamptons last year. Then I asked them just recently to do a very special yoga class in the bridal suite at Oheka Castle for my sister, the day before her wedding. My mom and I planned this as a surprise, so we waited in the suite with the lights dimmed, candles lit and yoga mats ready for my sister's arrival. When my sister walked in the room, her face lit up and she seemed to relax a bit just knowing she had at least an hour to herself. My sister was so happy when she saw another surprise, a monogrammed yoga mat with her new initials in her wedding colors. Rachael, our instructor provided us with an unforgettable, calming experience and all that stress of preparing for the big day just melted away. Rachael is a wonderful teacher and really personalized the class to our needs. Thank you so much for this wonderful experience! Can't wait till the next wedding :) " - Lisa L.
​" My girlfriends surprised me with a yoga class by Yoga Love Brides a couple of weeks before my wedding. I am a passionate yogi and recently certified in Vinyasa Yoga, but had never heard of this concept. It was so sweet and so much fun. I loved sharing this with the girls! The class was thoughtfully built to celebrate the bride-to-be & friends and took into consideration that it was for all levels. The teacher was and angel: we unanimously loved her! I wouldn't want to tell much more about the class as it's full of surprises and attentions. Book it and enjoy it! " - Christel P.
" My mom and sister surprised me with a Brides Love Yoga session the day before my wedding in my bridal suite. The entire experience was exactly what I needed - calming, refreshing and rejuvenating. Every detail was covered - from candles, to music, fresh tea and of course champagne! I could not have thought of a better way to start off my wedding weekend - everyone was commenting on how calm I was, thanks to Brides Love Yoga! Every bride should have this experience to destress from the craziness of planning and get ready for the big day. 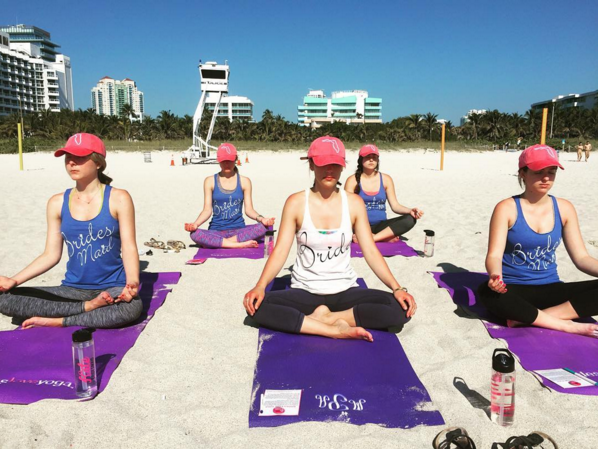 Thank you so much Brides Love Yoga for bringing such a wonderful yoga "experience" to me! " - Jeannine R.
" I'm so happy that my sister found Brides Love Yoga when booking my bachelorette party! Rachael was beyond amazing. The attention to detail was unparalleled, the food was delicious, her home was adorable, and we felt so comfortable the entire day. The SUP yoga was so much fun, and not only is Rachael a great host, she is also an amazing yoga teacher. I would ABSOLUTELY recommend Brides Love Yoga. Thanks again, Rachael! " - Katie N.
" When I first heard about Brides Love Yoga my first thought was "genius!" and my second though was "I'm doing this!". I decided instead of gifting my girls with standard wine glasses or the likeness, to give them a "bridesmaid proposal" they would not forget! I wanted an activity that would provide togetherness and create an opportunity for everyone to experience a memory with me and with each other, but what I got was so far beyond my expectations!! I honestly could not have imagined a more perfect night. Rachael worked closely with me to ensure the physical "gift" for my bridesmaids- the monogrammed mats- would be perfect! She carefully helped me to select the colors of the mats, the font and thread colors for the monograms, and gave excellent suggestions to make sure it would all go together nicely. She laid everything out in such a visually pleasing way which built so much excitement when the girls arrived! When I saw the mats myself, I was really surprised and impressed by how high quality they were (as I practice Yoga regularly and know a not-so-great mat can really impact the practice). Her teaching style was wonderful for girls of all different levels and she provided special attention and modifications to keep my pregnant bridesmaid safe and comfortable. She led such a personalized class which left everyone knowing how much I cared about them and want them by my side during this next year of my life. She incorporated specific "team building" type elements, that left us all feeling even closer than when we arrived (this is something that meant so much to me since naturally some girls in the bridal party did not know each other as well as other). Everything down to the champagne toast she set up (with sparkling cider for the non-drinkers) was so far beyond what I expected with such beautiful little touches (I won't go into specifics so future brides can be surprised as well!). A few weeks before the event we suffered the loss of one of our closest friends, one who was close to many bridesmaids. Rachael provided such a beautiful tribute to our friend! You would have thought she knew her as well for as personal and heartfelt as she made those moments for us. She seamlessly moved from this touching memorial into the practice reminding us that our friend was with us. She even provided a special gift to me in honor of Jen that I will be able to use for another personal experience on or closer to my wedding day. I could go on for hours (and have been ever since the event) about how special this day was for me (and have been reminded over and over again by my girls how special it was for them as well) but it is better to experience for yourself without anymore spoiler alerts. I will just end by saying that this unique experience was by far worth every penny and I am already trying to figure out ways to invite Rachael back for another experience as the wedding approaches. " - Aviva S.